Real estate data provider Altos Research is taking a very bearish outlook on the housing market. industry will lock home prices into a downward trajectory for the remainder of this year, with property values starting out 2011 even lower than they were in 2009. Data provided by Altos as recently as January pointed to a steady decline in housing inventories over the previous 16 months, at both the national and local market levels. But Sambucci says that quickly changed after the first month of this year. Since January, and particularly post-tax credit stimulus, Altos has tracked a rapid divergence in inventory numbers vs. listings sold and absorbed. This, Sambucci explained, means more inventory is coming onto the market, with less inventory leaving. As a result, he says, we’re going to see an extreme inventory overhang going into 2011. Add to that the fact that the pool of viable buyers out there is shrinking – thanks to tight credit, a declining homeownership rate, and more and more consumers being locked out of the market after a foreclosure – and you’ve got an equation that’s right in line with Altos’ bearish outlook. Following the rudimentary rules of supply and demand, more inventory with fewer takers equals lower prices. Altos Research provided its assessment of the most stable housing markets…and the markets that it considers to be on shaky ground. 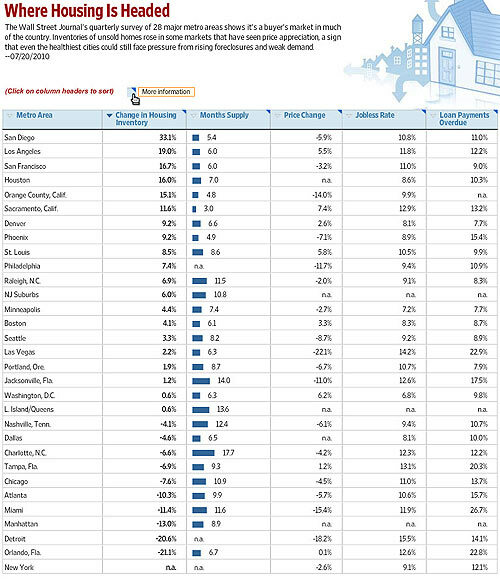 The San Francisco metro area topped the stable list, along with Las Vegas and Washington, D.C.
Unstable metros included Minneapolis, Denver, Chicago, and Phoenix. The only constant in the short sale world is change. Here at the firm we have a person on the staff who spends most of her day on foreclosure postponements. She is in touch with servicers and investors every day requesting postponements and has a wealth of experience. As a result she is very in tune with the process, the subtle changes that occur and the trends taking shape. To better serve our clients and keep are realtor partners up to date on what we are seeing please review the following information. Investors are not giving much weight to requests to postpone foreclosure sale dates on properties that are not under contract. There is a chance they will postpone the sale on their own but it is entirely up to the bank. We do see this happen but the postponements always happen at the last minute and are not usually a result of a request. More often than not it is because the file status at the servicer is incorrect. If you are going to submit an offer on a property at the same time you are going to request a postponement most lenders are requiring the offer to be submitted 10 to 14 days before the scheduled foreclosure sale date. Most lenders are looking at this timeline because it gives them a chance to get a BPO if they need one and it allows time for review of the offer. Fannie and Freddie are reviewing all contracts submitted in tandem with a request to postpone a foreclose sale date and seem to have caught up to the point where they can effectively manage this process much better. It doesn’t necessarily mean they are going to give you the postponement, it means they are sticking to the guideline more and more. Most of the mainstream servicers in the Phoenix area, such as BofA, Wells Fargo ,and Chase are all on the same page and we find consistency in the actions to the degree you can expect it. The review the offer goes through is somewhat cursory and if a postponement occurs it doesn’t mean your offer is accepted or approved it just means the investor would like to review the offer more closely. There are other servicer’s such as Suntrust, GMAC, ING, Etrade, Everhome and the like that are absolutely willing to take the home back in a foreclosure. There is very little give in their stance with last minute postponements and often times even with offers submitted and full files in the queue these servicers will not postpone. It doesn’t make sense but we see it on a daily basis. PNC/National City Mortgage and Amtrust will not accept requests per se. Their response to a request is something along the lines of “Our system notifies the negotiator of the impending sale and it is up to them to determine whether or not we request a postponement”. The other things we are seeing are shorter postponements i.e. 15 days instead of 30 days. Sales being placed on hold in lieu of being postponed so that if the bank wants to move forward with a sale all they have to do is take the hold off. This allows the trustee to sell the home very quickly without a lot of notice to any of the interested parties. The INVESTOR ultimately decides whether it is in their BEST FINANCIAL INTEREST to postpone a sale, if they decide it is in their best interest, they will postpone the sale, if they decide it’s not, then they will move forward with the sale. Just as the HOMEOWNER has decided it is in their BEST FINANCIAL INTEREST to sell their home, the bank has the right and frankly, the obligation to do the same. There are times when it’s hard to understand this from a consumer’s perspective. There are times when the property goes to sale as a result of investor indifference, lack of communication, or organizational dysfunction but these instances are a very small minority. The majority of foreclosure sales are methodical financial decisions made by investors. NEW YORK (CNNMoney.com) — The number of Americans who own homes fell in the second quarter of the year to the lowest level since 1999, said a government survey released Tuesday. The Census Bureau said the home ownership rate fell to 66.9% in the second quarter of 2010, down half a percentage point from the previous year. The home ownership rate was 67.1% in the first quarter of the year. In the second quarter rates were highest in the Midwest, where 70.8% of people are homeowners, and lowest in the West, where 61.4% of people own. Rates in the South and West were lower than a year ago, while the Northeast and Midwest stayed the same. Vacancies: The vacancy rate in non-rental units also fell in the second quarter, to 2.5%. Meanwhile, the vacancy rate in rental homes stayed steady at 10.6%. Almost 86% of U.S. homes were occupied in the second quarter, with owner-occupied housing comprising 57.3% of all housing units. Renter-occupied homes were 28.3% of all units. A separate report released Tuesday, the Case-Shiller index, showed home prices rose 1.3% in May compared with the previous month. Fannie Mae and Freddie Mac are beginning to initiate foreclosures at a faster pace. According to a new study from Lender Processing Services (LPS), GSE foreclosure starts have been accelerating and are currently at all-time highs. From May to June, foreclosures initiated by Fannie and Freddie jumped 21 percent. The GSEs’ prime borrowers are performing the worst. Foreclosure rates among the agencies’ prime loans have soared nearly 400 percent since January 2008, with a notable hastening tracked over the last two months, LPS reports. That increase is second only to the swell seen in non-agency “jumbo” mortgages, for more than $729,750. LPS says the recent momentum in GSE foreclosure starts coincides with Home Affordable Modification Program (HAMP) cancellations, with most of the volume concentrated in the very late stages of delinquency (six-plus months). The latest HAMP statistics from the Treasury showed an extremely elevated number of cancellations from trial plans, as many borrowers who received temporary modifications have not been able to verify their income or have missed trial payments. As of the end of June, 520,814 HAMP trials had been cancelled – more than have been converted to permanent status. In addition, 8,823 permanent modifications have been cancelled under the federal program. In contrast, LPS says foreclosure starts have remained relatively stable over the last several months for the rest of the industry. The company puts the overall foreclosure rate as of the end of June at 3.65 percent, but notes that foreclosure inventories are still elevated. According to LPS’ market data, total foreclosure starts for 2010 are at 1,456,000. That stat is lower than 1,682,000 for the same period in 2009, but up from 1,245,000 in the first half of 2008. Now that the Obama administration can claim victory in passing financial regulatory reform, it’s setting its sights on restructuring the housing finance system, namely the GSEs. The White House says it will put forth a formal proposal by early next year, and some say its focus will be a departure from the age-old adage of homeownership as everyone’s “American Dream,” and shift support for the housing market from Fannie Mae and Freddie Mac to the private sector. The secondary market lobbying group, the Securities Industry and Financial Markets Association (SIFMA), warns that the government can’t completely pull out of the mortgage market without sending costs skyrocketing for consumers. There’s no doubt change is coming for the nation’s two largest mortgage companies. Many were disconcerted that the Dodd-Frank Wall Street Reform and Consumer Protections Act didn’t include a new blueprint, or at least new rules, for Fannie and Freddie. Rep. Darrell Issa (R-California), ranking member of the House Oversight and Government Reform Committee, called the president’s signing of the Dodd-Frank bill a “charade” on true reform, particularly in light of Issa’s recent investigation that revealed former executives at both Fannie Mae and Freddie Mac accepted so-called sweetheart loans from subprime mortgage lender Countrywide before it imploded. “Despite the fact that the federal government was a willing accomplice in this nexus of special interest influence’s effort to shape the mortgage market jeopardizing our fiscal solvency, the President and Democratic Congress have responded to repeated calls to reform Fannie and Freddie with a deafening silence,” Rep. Issa said. Since the federal government took control of the GSEs in September 2008, the two companies have had to draw $146 billion in federal funding to stay afloat, giving taxpayers an 80 percent ownership stake in the mortgage financiers. Fannie and Freddie’s rescue has become the costliest of all the government bailouts, making the fact that the two companies were never mentioned in a bill that promises to end “too-big-to-fail” even that much more ironic. Recent estimates from the Congressional Budget Office (CBO) put the tab for subsidizing Fannie and Freddie at $389 billion, when all is said and done. Construction slows, inventories build amid weak job growth, tax-credit end. The housing market, whose collapse pulled the economy into recession in late 2007, is stalling again. In major markets across the country, home sales are deteriorating, inventories of unsold homes are piling up and builders are scaling back construction plans. The expiration of a federal home-buyers tax credit at the end of April is weighing on the market. On Tuesday, the U.S. Census Bureau said single-family housing starts in June fell by 0.7%, to a seasonally adjusted annual rate of 454,000. The U.S. started 1.47 million homes in 2006, before the housing bubble popped. Future construction looks even weaker. 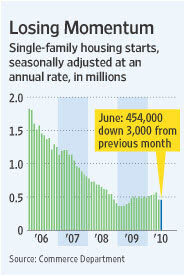 Permits for single-family starts fell 3% in June, following big declines in both May and April. “We’re hovering at post-World War II lows,” said Ivy Zelman, president of Zelman & Associates, a research firm. Economists aren’t singling out one reason for the stalling housing market. A variety of factors have led to flagging confidence, they say, including sluggish labor markets, global economic turmoil and falling stock prices. While the housing downturn dragged the economy into a recession nearly three years ago, now it is the economy that is pulling down housing, says economist Patrick Newport at IHS Global Insight. Without sustained job growth, the housing market likely won’t improve. That in turn will ricochet across manufacturing, retail and other trades heavily dependent on home building and consumer spending. The Wall Street Journal’s quarterly survey of housing-market conditions in 28 major metropolitan areas shows that inventory levels have grown in many markets. But inventory fell in some of the weakest ones, including several Florida markets, Atlanta, and Charlotte, N.C.
At the end of June, inventory was up 33% from year-ago levels in San Diego, and by 19% and 15% in Los Angeles and Orange County, Calif., respectively, according to data compiled by John Burns Real Estate Consulting. Rising inventory can lead to price declines later. Jeff Gans, a 45-year-old engineer from Baltimore who designs software for car manufacturers, has contemplated buying a house or condo for more than a year. But concerns about job stability have kept him on the sidelines. Even falling interest rates aren’t enough to whet consumer appetites for housing. Last week, the average rate on a 30-year fixed-rate mortgage was quoted at 4.57%, according to Freddie Mac, the lowest since its survey began in 1971. But demand for home-purchase mortgages sits near 14-year lows, according to the Mortgage Bankers Association, down 44% over the past two months. The government last fall extended tax credits worth up to $8,000 to home buyers who signed contracts by April 30, causing sales to surge early this year. Those buyers had until June 30 to close their sales until Congress, concerned that the backlog of sales wouldn’t close in time, extended the deadline through September. Analysts long expected the withdrawal of a federal tax credit, which had juiced sales, to lead to a slower-than-usual summer. Reports should show that completed transactions of home sales held up through June. But newly signed contracts in May and June have plunged. To be sure, some housing markets show signs of healing. Home-sales activity in New York, Washington, D.C., and parts of California continue to improve. But other markets, including Tampa, Fla., and Chicago, face rising foreclosures and weak job growth. Low mortgage rates and falling prices have made homes more affordable in many markets than at any time in the past decade. But those affordability gains have been offset for many buyers by tighter lending standards, particularly for “jumbo” loans that are too large for government backing. Banks are requiring down payments of 20% and more and strong credit scores because they must hold jumbo loans in their portfolios. More broadly, the housing market faces two big problems: too many homes and falling demand. More than seven million borrowers are 30 days or more past due on their mortgage payments or in some stage of foreclosure. Rising foreclosures will keep pressure on prices as banks put more homes on the market. Last month, nearly 39,000 borrowers received government-backed loan modifications, but more than 90,000 borrowers fell out of the program, the Obama administration said on Tuesday. Moreover, the pool of potential buyers remains constrained by the unprecedented number of homeowners who are underwater, or who owe more than their homes are worth. That’s making it particularly hard for traditional “trade up” homeowners like Maria Billis to pull the trigger on a home purchase. Ms. Billis can’t sell her townhouse in Boynton Beach, Fla., because its value has fallen by a quarter. That puts it below the $160,000 that she owes the bank. Mortgage-finance giants Fannie Mae and Freddie Mac also are starting to push more repossessed homes onto the market. The companies owned 164,000 homes at the end of March, up 80% from a year ago. Another reason inventory is rising: “Unrealistic sellers have flooded the market” after reports of bidding wars and home-price increases earlier in the year, says Steven Thomas, president of Altera Real Estate, a brokerage in Orange County. The amount of time that homes there have sat on the market there has swelled to 3.78 months, up from 2.35 months in April. Not all sellers will take that step. Jerry Anderson has listed his four-bedroom home in Dana Point, Calif., on and off the market for the last two years. He’s cut the price to $1.25 million, down from $1.75 million, but hasn’t had any offers on the home, which has three fireplaces and ocean views. Mr. Anderson, who bought the home in 1987, says he’ll take it off the market in December if it doesn’t sell rather than cut the price. Matt Carney listed his Moreno Valley, Calif., home for $337,000 in February, and lowered the price on Tuesday for the third time, to $297,000. He says he can’t go any lower because he owes $274,000 on the home and doesn’t want to dip into savings to pay for transaction costs. A recently implemented federal housing-market stimulus program designed to encourage short sales appears to be doing just the opposite, according to Phoenix-area real-estate agents, title companies and mortgage lenders. Home Affordable Foreclosure Alternatives, the fourth initiative to be launched under the banner of the Obama administration’s Making Home Affordable program, offers a cash incentive of up to $3,000 to homeowners on the brink of foreclosure who stick around to complete a short sale or deed in lieu of foreclosure, rather than just walking away. It also provides a bonus of up to $6,000 to loan servicers for every short sale or deed in lieu they approve. A short sale is one in which the home’s seller owes more on the mortgage than the home’s sale price would cover. The lender must agree to remove its lien from the property despite the unpaid loan balance. A deed in lieu of foreclosure involves the delinquent homeowners signing the deed to their home over to their primary lender and walking away from the mortgage. The exchange occurs by mutual agreement, rather than by default. While deeds in lieu are relatively rare, short sales have become foreclosure’s twin engine in driving the housing market through its current readjustment period following an unprecedented real-estate bubble that burst in 2007. Short sales are better for the housing market than foreclosures, because short sales generally do not lead to long periods of home vacancy, as foreclosures often do. With that in mind, real-estate agents and others said they had been eagerly anticipating the April’s implementation of the federal short-sale program, nicknamed HAFA. That excitement quickly turned into disappointment as the effects of HAFA started to become clear, they said. First of all, HAFA short sales require double the paperwork of other short sales, said Tempe real-estate agent Steve Trang of Occasio Realty. “The most irritating thing is going from a document that was 50 pages to one that’s 100 pages,” Trang said. HAFA short sales also can take twice as long to complete, said Steve DeLaveaga, vice president of sales and marketing at Fidelity National Title in Tempe. A typical short sale takes longer than regular home sales because there are extra steps and more people involved. However, DeLaveaga said most lenders had done a good job of streamlining the process in the six months leading up to April. Before HAFA, the typical escrow period was 35 to 50 days, DeLaveaga said. Now it’s taking 75 to 100 days. Most big consumer-mortgage lenders now require HAFA applications for all short sales, he added, even when the sellers have little chance of qualifying for the $3,000 relocation allowance. Only about 10 percent to 20 percent of Phoenix-area short sellers actually qualify for the money, according to DeLaveaga and others. Over the past three months, HAFA short sales have developed a reputation for being more time-consuming, labor-intensive and unreliable than comparable short sales occurring outside the federal program, Trang said. For instance, a HAFA applicant’s lender must send a letter of approval to the program’s administrators in Washington, who then must review the application themselves. Delays on the part of lenders and the government have dragged out the sale process, he said. In some instances, the buyers have gotten impatient and walked away from the deal. “We have a government that is well-intentioned, but they’re adding more obstacles,” he said. HAFA is the fourth program to be implemented under the Obama administration’s $75 billion mortgage-relief effort, known as Making Home Affordable. Its two key components, the Home Affordable Mortgage Program and Home Affordable Refinance Program, have undergone a number of revisions, primarily to reduce eligibility standards in response to lower-than-expected participation. HAFA is likely to be subjected to a similar tweaking process, said Jay Butler, associate professor of real estate at Arizona State University’s W.P. Carey School of Business. “Basically, they’re trying different things to see if they work,” he said. Dan Noma Jr., branch manager at Arizona Best Real Estate in Chandler, said he is optimistic about HAFA’s potential for helping the local housing market. The biggest problems are that too few consumers know about the program, he said, and too few real-estate agents know how to effectively push through a HAFA deal. Chad Melin, branch manager at Academy Mortgage in Mesa, said real-estate agents should warn their clients to start putting together the documents required under HAFA, which include proof of income and evidence of financial hardship. Noma said he still believes the program ultimately will help people once it has been broken in. HAFA eligibility lasts until Dec. 31, 2012. Gilbert HomeStart real-estate agent Maria Hass said she was not optimistic. Please Join us for an Understanding HAFA Class on July 27th!!!! RSVP today! This empowering course will give you the tools you need to survive in todays ever changing and dynamic real estate market! For Additional Information and to RSVP Click Here! 1. If your mortgage lender tries to make contact to notify you of your eligibility to conduct a Short Sale under HAFA program and you fail to contact them within 14 calendar days of receiving the notification, your mortgage lender has no further obligation to extend the HAFA Short Sale Agreement (SSA) to you. 2. You cannot participate in a HAMP Trial Loan Modification and agree to a HAFA SS simultaneously. 3. You may be required to make partial mortgage payments until your houme is sold and title is transferred. 4. You must maintain the home and have it available to show. 5. You must pay your association dues and assessments. 6. You must list the property with a real estate agent. 7. You cannot sell your home to anyone related to you or with whom you have a close personal or business relationship with. Neither you nor the buyer can receive any proceeds from the sale. 8. If you are a real estate agent, you cannot list your own property or receive a commission or any proceeds related to the sale of your property. 9. The buyer of your property must agree not to sell the home w/in 90 calendar days of the date it is sold by you. 10. A 1099C will be sent to the IRS as debt forgiveness. In some cases, this can be counted as income and be taxed as such. You should contact the IRS or your tax preparer to determine if you have any tax liability. 11. You are responsible for taking steps to clear all other subordinate liens on the property such as home equity lines of credit and second mortgages. Your first mortgage lien holder will only allow up to 6% of the unpaid principal balance of each subordinate lien, in order of priority, not to exceed $6000 for ALL liens. 12. The sale of your home may be contingent on mortgage insurer/guarantor approval then you may have to negotiate terms with them as well. 13. Your mortgage will be reported as “Settled for less then full amount” on your credit report. 14. Your mortgage lenders have agreed NOT to pursue you for any deficiency, please make sure you receive that agreement in writing. 15. You will receive an incentive payment at closing in the amount of $3000 for a completed Short Sale under the HAFA program.